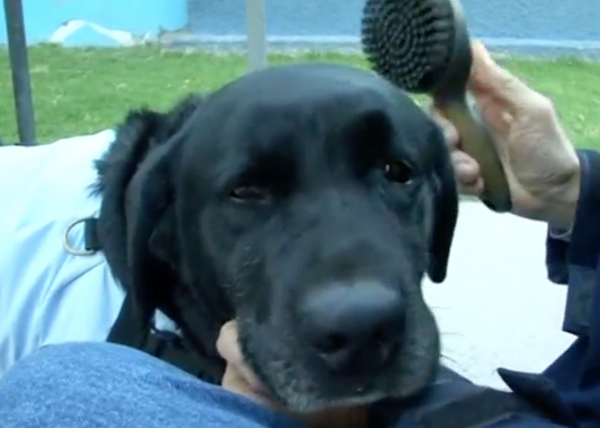 In Santiago, Chile, dogs are being used to help children relax during dental treatment. The Labrador retriever therapy dog, Zucca, recently helped Mateo, a boy with autism, remain calm during surgery. Zucca is owned by Raul Valera who directs the non-profit organization, Junto A Ti—meaning “next to you” in Spanish. Valera said that parents have responded with positive feedback to the use of the dogs. Many doctors, who were originally resistant to the idea, have seen its benefits over treating a child with general anesthesia. Pediatric dentist, Eugenia Meses said that children’s stress levels go down a lot, especially children with autism and down syndrome. Mateo’s mother, Maria Fernanda Careers, said that the use of the dogs is wonderful. She added that she has never seen Mateo so calm and relaxed; it helped him overcome his communication difficulty. “He let the dentists work … he did not even shout,” she said.